NUSA DUA, BALI, INDONESIA, July 3, 2018 /EINPresswire.com/ -- A spacious, beautifully-appointed villa at The Ritz-Carlton, Bali, provides a luxury holiday retreat with access to all the fantastic facilities the resort has to offer, from award-winning restaurants, to the sublime The Ritz-Carlton Spa, Ritz Kids Club and dedicated Concierge Service. 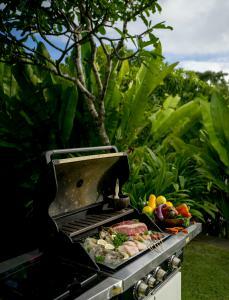 Villa gardens also make the perfect setting for memorable dining opportunities, such as the In-Villa Family Barbeque. While some villas cling to the cliff tops with panoramic ocean views, others are absolute beachfront, just meters from the Indian Ocean. All villas have private swimming pools set in flourishing tropical garden and create a luxury home away from home. One of the advantages of staying in a spacious villa is that rather than bringing the kids out to a restaurant, you can have the chefs come to your villa and prepare a veritable feast, in the privacy and comfort of your own garden. Synonymous with good times, barbecues are a great way to enjoy a tropical evening and a chance to enjoy a casual and tasty meal with friends and family. 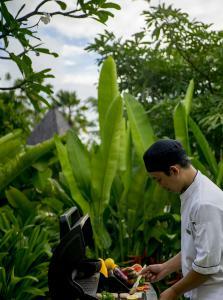 Best of all, when you reserve an In- Villa Barbecue, you won’t need to prepare a thing, as the Ladies and Gentlemen of The Ritz-Carlton, Bali will take care everything for you, while our chef expertly grills up a delicious feast right before your eyes. Think about a freshly-caught Barramundi cooked with sambal and lime, or Tiger Prawns basted in chili and garlic. Meat lovers can indulge in prime Black Pepper Australian Beef Steak cooked to their liking, while Sweet Soy Marinated Chicken Satay will please everyone. 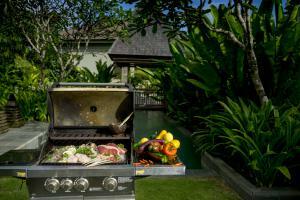 Apart from succulent meat and freshly-caught seafood grilled to perfection, The Ritz-Carlton, Bali In-Villa Barbecue also includes a delicious assortment of appetizers and salads, as well as Indonesian Fried Rice and Baked Potatoes with Rosemary. Fresh baked bread and a selection of condiments, from spicy Indonesian sambals to barbeque sauce, peanut sauce and mustard make the perfect complements. Pastry chefs will provide a delicious Dessert of the day and fresh tropical fruit platter to finish the meal. “Dining outdoors is one of life’s greatest pleasures and what better way to enjoy the lush tropical garden and beautiful views from your own private villa than enjoying an In-Villa Barbecue with your loved ones at The Ritz-Carlton, Bali. ” says GM Karim Tayach. The In-Villa Family Barbecue is available at IDR1,500,000 onwards plus 21% government tax and service charge per person and needs to be booked one day in advance.